I am pleased to have the opportunity to address some of your readers’ questions about the dies of Karl Goetz that Heritage Auctions will be offering over the coming year. The reason that the dies have not been cancelled is because they were never used to strike legal tender coins. Government mints cancel dies to prevent illicit counterfeiting of money but these dies were held by Goetz for his personal and commercial use. The very modern idea of limited editions to increase the collectability and, therefore, the value of a series of medals or coins wasn’t commonplace in the mid-20th century. In fact, several of the hubs for award medals, weddings, and patterns for coins have been purposely left blank in areas so that Mr. Goetz could customize part of the legend prior to striking a run of them. As a private medalist and engraver, Mr. Goetz would have wanted as many prepared dies as possible to choose from for new commissions, which is why there is some bleed-over of obverse or reverse types between several of the Opus numbers in the Kienast catalog (the standard reference for the medals of Goetz). The dies and hubs were purchased recently from the Goetz family by an anonymous consignor who wished for Heritage Auctions to present them over the course of the next year. Most of the dies and hubs have been used. For those of your readers unfamiliar with the die production process, hubs are the “positive” image produced for use as a master to impress the “negative” image into a die to ensure uniformity as dies wear out and need to be replaced. We have noted in our descriptions those dies with large cracks or excessive corrosion but strongly encourage potential bidders to carefully examine our high-resolution photographs prior to bidding as these lots are being offered “as-is” due to their weight and the large numbers of them that we are trying to sell. 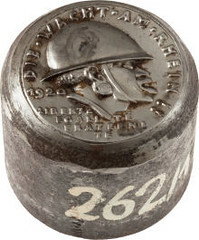 We are selling the dies in order as they are presented in Kienast and so will be presenting the history of Germany in the form of dies either commemorating or criticizing current events from the turn of the 20th century through World War II.